City gardeners have problems no farmer in the country faces. Can you relate? When you begin to garden in the city, the future is as ripe as the tomatoes you expect to harvest. But if a squirrel steals your first fruit or a neighbor complains, growing your own suddenly doesn’t seem like so much fun. Take heart—urban gardening nuisances are shared among friends of the soil. Remember, you’re not in this alone. Save yourself future trouble, and do your homework before planting your garden, Fiegelist advises. Talk with your local government or neighborhood association to find which rules apply to you, and even consult experienced local gardeners about how they’ve handled zoning restrictions. “We like to connect newbies to more experienced homesteaders who are always ready to lend a hand,” Fiegelist says. Dense urban areas often lack “black gold,” the rich loamy soil of a gardener’s dreams. But the dirt in your backyard might be worse than clay—it could be contaminated with building materials and toxins. Lead is a particular problem, especially in neighborhoods with an industrial history. An easy and inexpensive to find out if your soil is contaminated is to test your soil. If your state cooperative extension agency doesn’t already offer this service, they should be able to provide you with a list of local soil-quality labs. For a small fee, the labs can analyze the level of potential toxins in a soil sample, as well as the nutrient balance so you’ll know what amendments you need for optimum vegetable growth. Another option is to build a raised bed and fill it with a custom soil mix so you know exactly what you’re growing in. All gardeners face the wrath of wildlife, be it a hawk looking for a backyard chicken dinner or a groundhog munching on your heirloom lettuce. Sometimes urban gardeners have it easier than their rural counterparts because dense human population keeps bigger predators like coyotes and deer away, but certain produce-loving animals thrive in cities—and the neighbor down the road might be feeding the same squirrels and raccoons you wish would starve. Observe carefully and look for tracks to determine which pest you have, then research ways to keep it out of your garden. Sometimes the solution is as erecting a fence or spraying a deterrent, but start seeking out solutions from gardeners in your community, and you might find some thrifty DIY defense tactics, well. Keep in mind, though, that some pest deterrents that rural farmers use aren’t options for city gardeners. While you view your vegetable garden is a place of beauty and keep chickens as “pets with benefits,” some neighbors might wish you just had a lawn like everyone else—and they make their opinions heard whether you like it or not. Finding a tribe of fellow urban gardeners is the best way to maintain your motivation when gardening gets tough. Seek out homesteading friends at local garden clubs, farmers’ markets, plant nurseries and neighborhood-specific online groups. Use the information you gather from your support system to start pleasant conversations with your neighbors. A gift of fresh eggs or produce never hurts, and perhaps you’ll eventually convert naysayers into gardeners. Once the gardening bug bites, your backyard will suddenly appear tiny. “We are quite limited in space as our lot is fairly small and shaded,” Carter says. Most urban gardeners, especially those in established neighborhoods with full-grown trees, echo her sentiment. 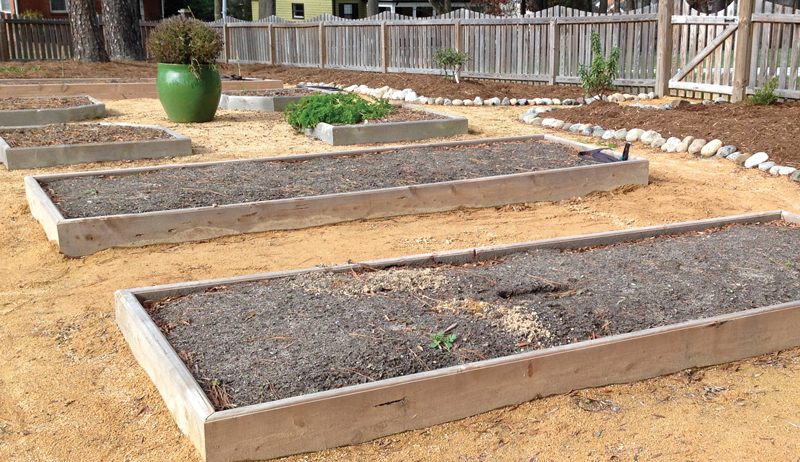 The harvest of your dreams may not be achievable on an urban-sized lot. Employ space-saving techniques like vertical growing, intensive plantings, and season-extending row covers and hoops to increase your harvest and fit more plants in. And don’t limit yourself to the backyard—tuck herbs and perennial fruits into your front yard, side yard, windowsill and anywhere else they will fit. When your garden can’t grow any taller or expand in any more directions, turn to the farmers’ market or U-pick orchards for canning quantities or items you can’t grow because of limited space. You’ll be eating well and supporting someone who may have started out in with a small garden like yours! About the Author: Rachel Tayse faces zoning challenges, predator pressure and other urban gardening nuisances on her 2-acre homestead in central Ohio. She writes about her adventures on her blog, Harmonious Homestead.